Welcome to our section on powerlifting belts. This is going to be a premium resource that you can rely on for insight into matching up with the best powerlifting belt possible. As you read through this, it’s important to keep in mind that each person will have their own preferences in terms of what they want in a powerlifting belt. Therefore, we’ll give feedback in terms of what you should be looking for, why you may want to wear a powerlifting belt, and then a few brands that are our favorites. Here is a look at what we think to be the top 3 powerlifting belts, as well as some other helpful insight to keep in mind while training. We get it, as does everyone else in the gym – you are a manly-man that throws around a ton of weight. Therefore, you don’t need no stinking belt to help keep your form, right? Wrong! That’s because a powerlifting belt does so much more for you than just keep your form. Instead, a powerlifting belt is going to be ideal for helping to keep your back as comfortable as possible while training. This means less injuries, more stability, and better overall workouts. In addition, your powerlifting belt will help you take your lifts to the next level, and you’ll be thankful that you were willing to make the switch. Width of the belt – The width of the belt will determine how much surface area it covers on your back. Thicker belts can be ideal for more security, but they aren’t always the best when it comes to comfort. That’s why you should consider a width that is as comfortable as it is supportive for your specific wear. In addition, the width of the belt should be as thick as possible, while still being comfortable. Maximum circumference and buckle notches – Whether you have a small or large frame, you’ll want to consider the circumference of the buckle notches. If the belt is too loose, then you won’t have nearly enough stability. Then again, a belt that is too tight won’t be comfortable while training. A prong or lever system – We’ll go into further detail later, but depending on whether a belt has a prong or lever system for locking will also be vital information. We’ll discuss the difference between lever and prong belts, as well as what might be best for you. The brand – You don’t have to be a label snob to care about the brand of your weightlifting belt. Even if you don’t splurge for the top-of-the-line model, make sure you don’t set your standards so low that you get a crappie piece of equipment. Now that you know what to look for in a belt, here are our top three choices for powerlifting belts. 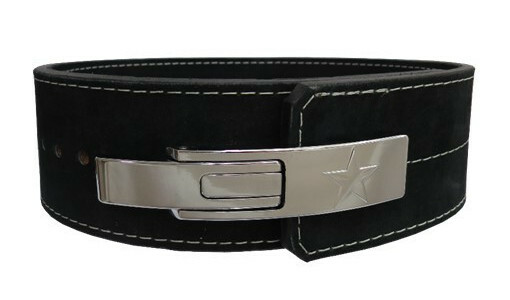 We love this first belt for a variety of different reasons. The Toro Bravo Suede Powerlifting Lever Belt offers multiple different positions for tightening, which makes for extreme comfort while lifting. In addition, a 10 mm thickness means that you are getting an incredibly sturdy and wide belt that will keep your back safe. In a future review, we’ll talk about the standard chrome plated material that makes for a stronger attachment, as well as the fact that this belt is IPF approved. For now, it certainly is worthy of the conversation among top powerlifting belts to choose from. We did our best to hold out as long as we could, but when you are talking about fitness you can’t escape the fact that Rogue Fitness will sooner or later find it’s way to the conversation. For powerlifting belts, we’re huge fans of the Rogue 13mm powerlifting belt. 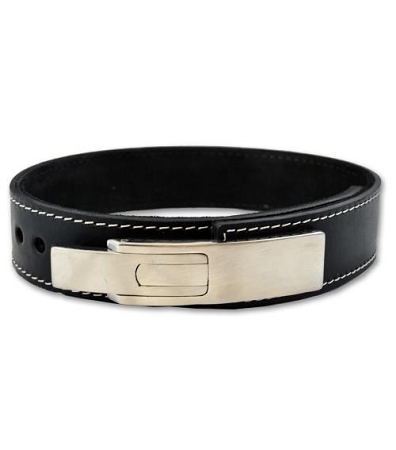 This black leather belt is made in America and it offers a single prong design that we love. 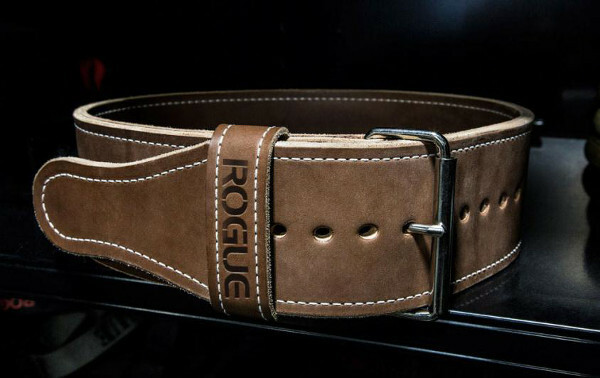 If you are someone who has outfit the rest of your gym with Rogue equipment (we don’t blame you if you did), then this belt will look great alongside everything else. And when you strap it up and get ready to go train, you know that you’ll be safe as you start hitting things hard. We’ve come across Lift Large a few times on the circuit, but they really impressed us here with their Level Belt. We actually will likely mention a few other pieces of equipment that they have throughout this site (such as singlets and knee wraps), but we would highly recommend first trying out this belt if you want to get better acclimated with the company. What we like most about the Lift Large Lever Belt is the 10 mm diameter, with added support along each end that makes for ever more comfort. With a chromed lever on the front, we also think that this is one of the better looking belts that you’ll find on the market as well. We know that powerlifting is not all about show, but, hey, it can’t hurt to look great while you are throwing around tons of weight. A powerlifting belt is something that many athletes will overlook. In order to get a good one, you are going to have to pay upwards of $20 or more. That’s a decent investment that the casual athlete may not want to make on training gear. But you aren’t a casual athlete, are you? No. Instead, you are someone who needs the best, which is why you need to have a powerlifting belt in your gym bag. If you don’t, there is no telling what sort of injuries you might be putting yourself at risk of sustaining. Be sure to check out our further breakdown on each belt, where we will go into detail as to why each belt might be best for you.